The style of carving on the present lot is typical of bamboo carvings made in the Jiading region in the late Ming and early Qing dynasties. The treatment of the figure and tree are closely related to those found on a bamboo brushpot dated to the Kangxi period depicting a similarly dressed scholar reclining on a pine bough, illustrated by S. Kwan in Ming and Qing Bamboo, The University of Hong Kong, 2000, p. 241, where it is mentioned that the style is typical of the school of Wu Zhifan, suggesting that the current lot could be similarly classified. 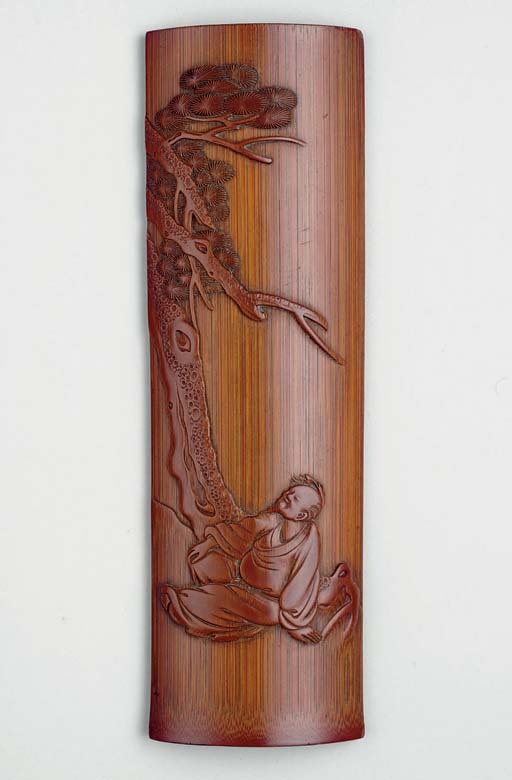 For another wrist rest of similar composition and subject matter, see Series of Exceptional Carvings - Selected Ming & Qing Bamboo Carvings, National Museum of History, Taipei, 1994, p. 125.